Remember when we established that there are a few types of Thanksgiving people? Like, some people are turkey people, side people, pie people? Well, who are these turkey people? Must be a very small portion of the population because we all know the BEST part about Thanksgiving is the pie. And coming in second are the SIDES. As far as Thanksgiving sides go, tradition reigns supreme in this family. The typical line-up includes green bean casserole, sweet potato casserole, and apple + sausage stuffing. I hope that they’ve found a spot on your Thanksgiving table too! We have one new addition at the table this year. Well, TWO ♥ Noelle’s first Thanksgiving will be known as the cheddar biscuit Thanksgiving. Lucky little lady!! Remember when we discussed buttermilk biscuits at length in the spring? I had extra large nerd glasses on that day because not only did I go into deeeeeep detail about biscuit making– I had a lot of fun doing so. Gah I’m such a dork! We went over 6 easy biscuit making steps and 6 helpful tips to go along with each step. I’m putting those glasses back on because we’re doing it all over again today. But this time with garlic, cheddar, and even more butter. 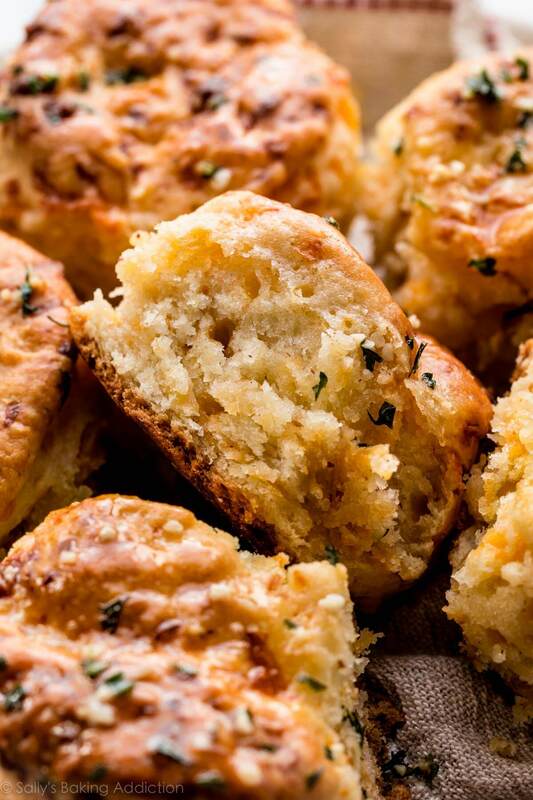 These homemade cheddar biscuits are too good to be real. No. They’re too good to be LEGAL. They taste similar to Red Lobster’s version, which easily rival The Olive Garden’s breadsticks. Um, remember when I told you I’m not a bread person? Lies. This is my go-to recipe producing tall biscuits with a million layers of flakes inside. It’s easy, quick, requires minimal ingredients, and guarantees biscuit success. Today we’ll add a cup of sharp cheddar cheese and a sprinkle of garlic powder. Mingling with butter, buttermilk, and a little honey, cheese and garlic feel right at home. 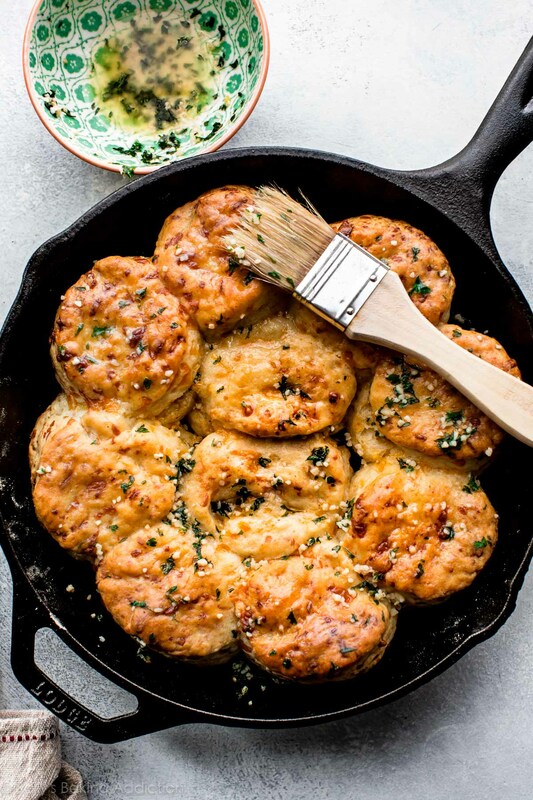 Once the biscuits come out of the oven, we’ll brush them with melted butter, garlic, and parsley. All good things here. I have 2 quick tricks for flaky biscuits and 2 quick tricks for tall biscuits. First, flakes! For flaky layers, use cold fat. This is very important. When little crumbs of butter melt as the biscuits bake, they release steam and create little pockets of air – this makes the biscuits flaky on the inside while remaining crisp on the outside. You don’t want to butter to melt BEFORE hitting the oven because then there would be no steam. No steam means no pockets of air. No pockets of air means no flakes. 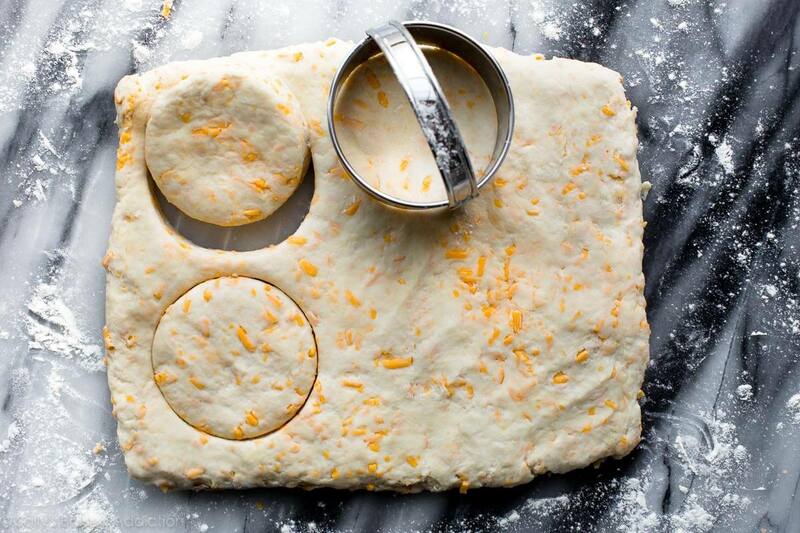 For the flakiest cheddar biscuits ever, fold and flatten the dough. Folding and flattening creates layers of flakes. 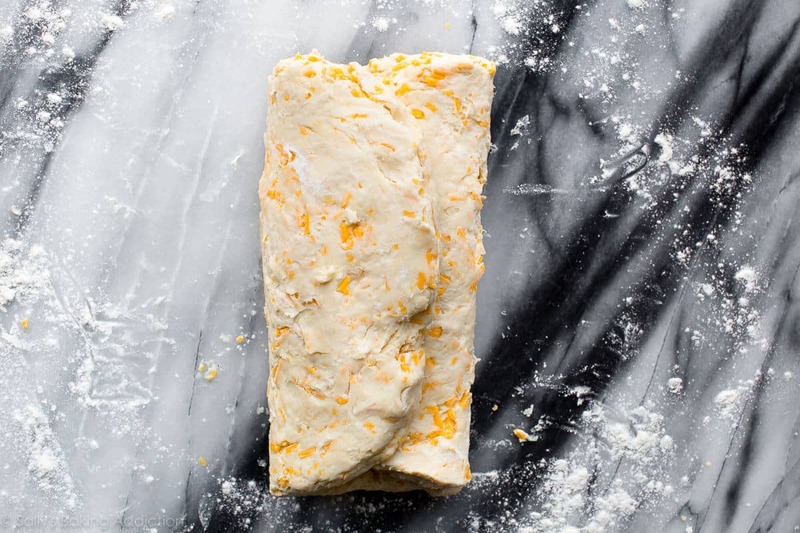 Turn the scrappy, shard-y looking dough out onto a work surface and mold it together with your hands. Form into a rectangle, then begin folding. Let me show you. Then press it down into a rectangle and repeat the folding process 2 more times before cutting into circles. Now let’s move onto the tricks for tall biscuits. When cutting the dough with a biscuit cutter, don’t twist the cutter. Twisting it will seal off the biscuit edges, preventing the biscuits from rising. Biscuits rise up nice and tall when they’re pressed snuggly against one another. Arrange them tightly in a cast iron skillet or on a lined baking sheet/baking pan. A cast iron skillet helps produce a super crisp bottom, so I prefer it over a baking sheet or pan. 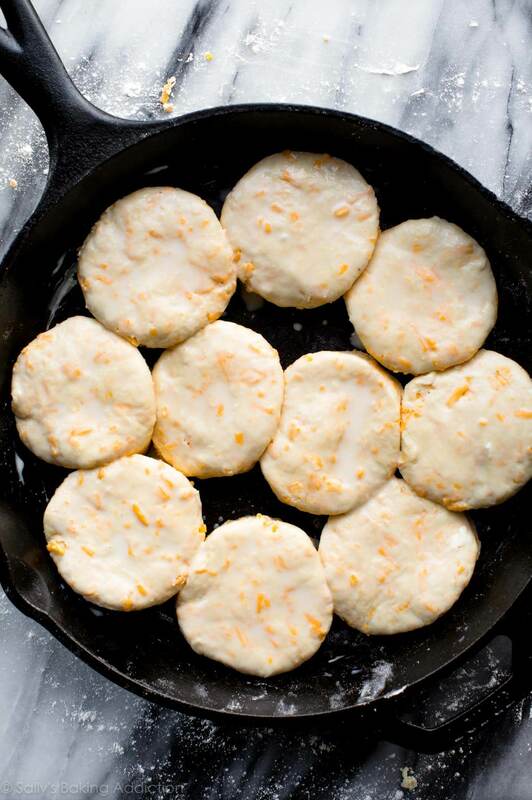 Before baking, brush the biscuits with a little extra buttermilk. Why? Helps achieve a slightly crispier crust. 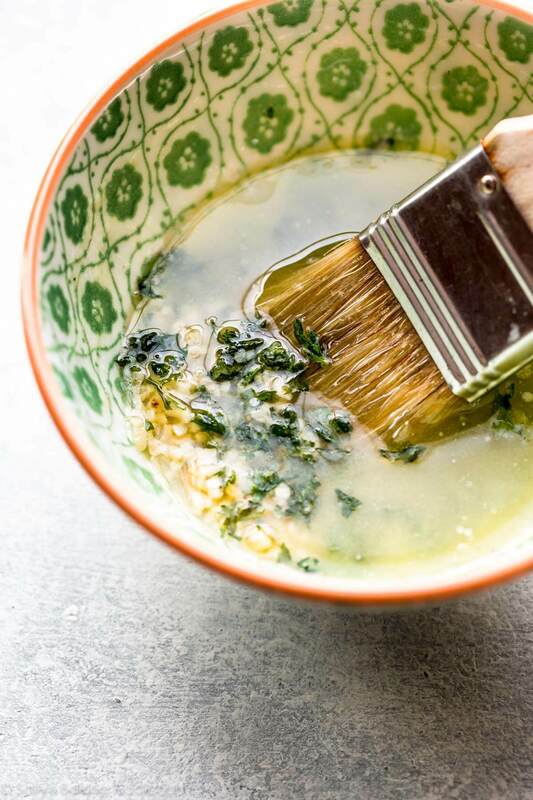 After baking, brush with garlic butter. Why? Because yum. The garlic butter seeps down into all the crevices and, obviously, makes the tops extra buttery. So let’s get all this straight. There are 2 things we need to remember for flaky biscuits and 2 things we need to remember for tall biscuits. 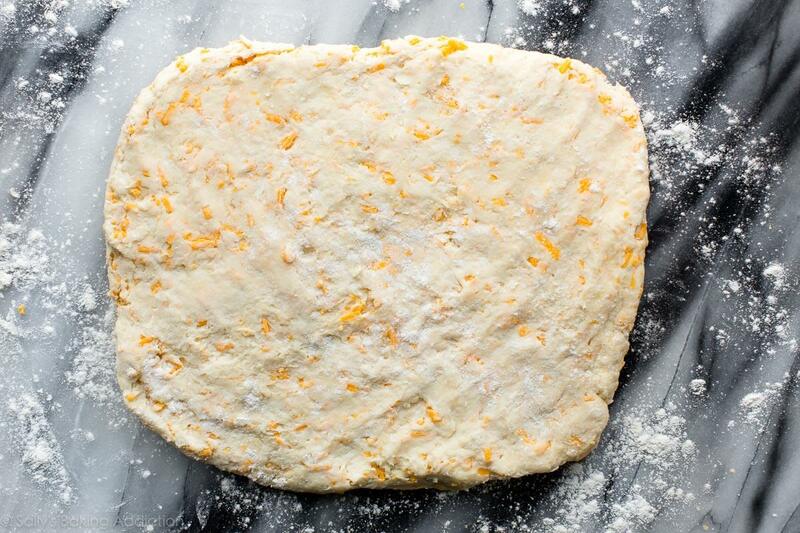 We’ll (1) use cold butter in the dough and (2) fold the dough together a few times to help guarantee lots of flakes. We (1) won’t twist the biscuit cutter and (2) we’ll place the biscuits super close together so they rise super tall in the oven. 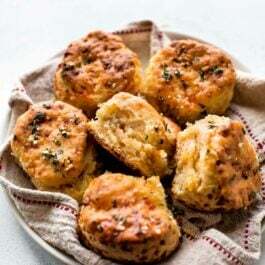 And 2 things to remember for delicious biscuits: cheddar + garlic. EASY! You got this! Best Thanksgiving side! 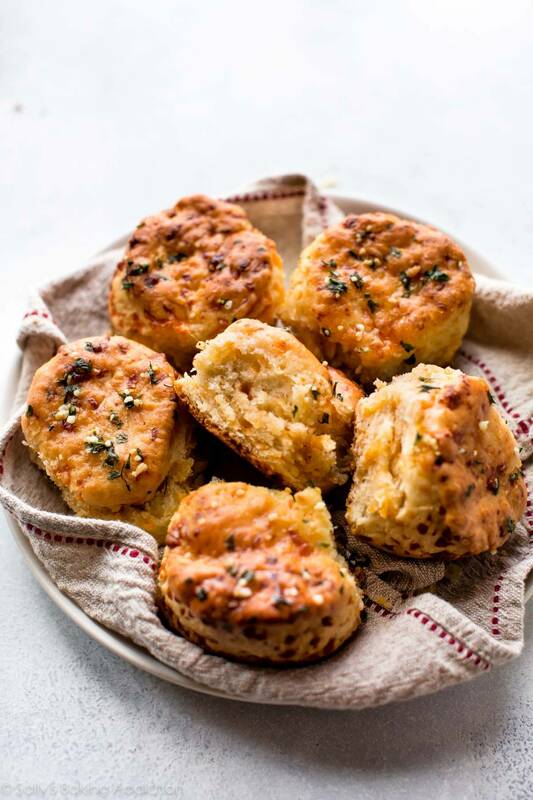 These delicious homemade cheddar biscuits easily rival Red Lobster’s cheddar bay biscuits. Made in only 20 minutes, they’re a must try at dinnertime. Preheat oven to 425°F (218°C). 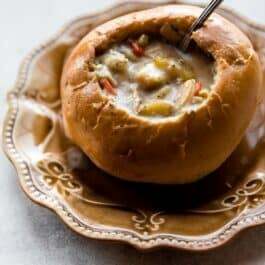 Place the flour, baking powder, garlic powder, and salt together in a large bowl or in a large food processor. Whisk or pulse until combined. Add the cubed butter and cut into the dry ingredients with a pastry cutter or by pulsing several times in the processor. Mix/pulse until coarse crumbs form. See photo above for a visual. If you used a food processor, pour the mixture into a large bowl. Stir in the cheddar cheese. Make a well in the center of the mixture, then pour 1 cup of buttermilk (240ml) on top, then the honey. 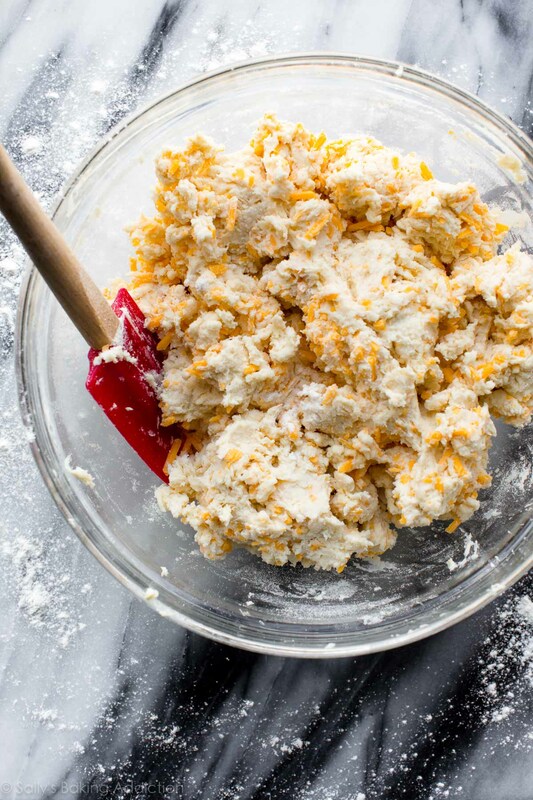 Stir everything together until just about combined– do not overwork the dough. The dough will look like shreds and be very crumbly. See photo above for a visual. 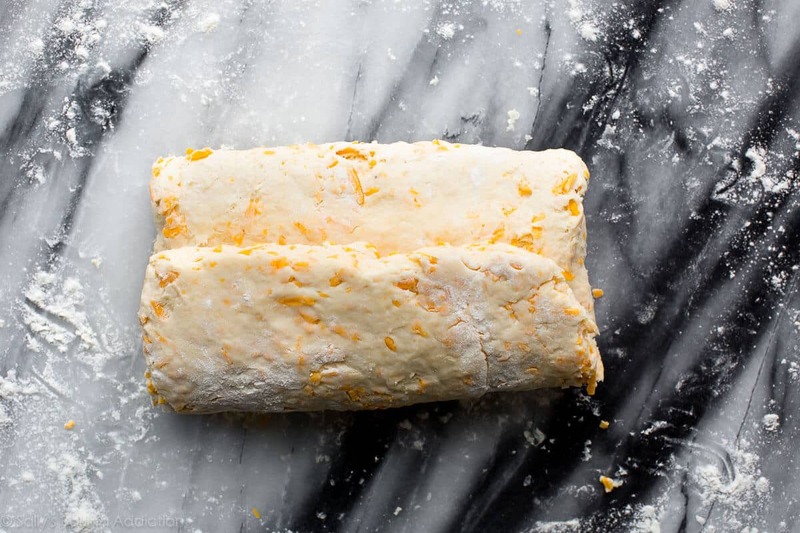 Turn the dough out onto a lightly floured work surface and gently mold it into a rough looking rectangle using your hands. Use the photos above as a guide. Fold one side into the center, then the other side. 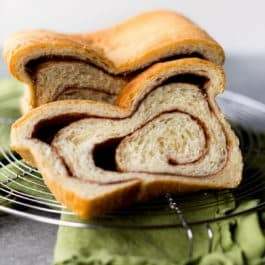 Turn the dough so it’s long horizontally. Gently flatten. Repeat the folding again. Turn the dough so it’s long horizontally once more. Gently flatten. Repeat the folding one more time. Brush the tops with remaining buttermilk. Bake for 15 minutes or until biscuits are golden brown on top. Remove from the oven. Combine the topping ingredients and generously brush over warm biscuits. Enjoy biscuits warm. Cover leftovers tightly and store at room temperature or in the refrigerator for up to 5 days. 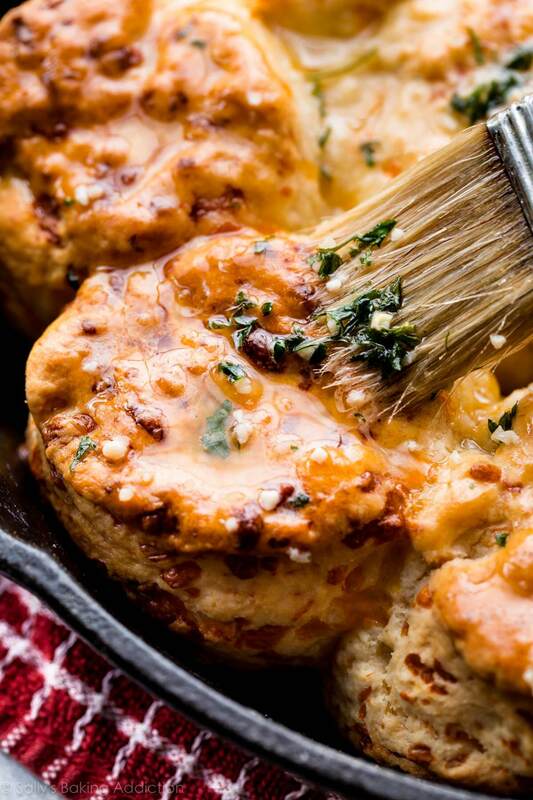 Make Ahead Instructions: Baked biscuits freeze well for up to 3 months. Thaw overnight in the refrigerator and warm to your liking before enjoying. You can also freeze the biscuit dough. Prepare the dough through step 3. Wrap up tightly in plastic wrap and freeze for up to 3 months. Thaw overnight in the refrigerator and continue with step 4. Also, after step 3, you may wrap up the dough in plastic wrap and refrigerate for up to 2 days before continuing with step 4.